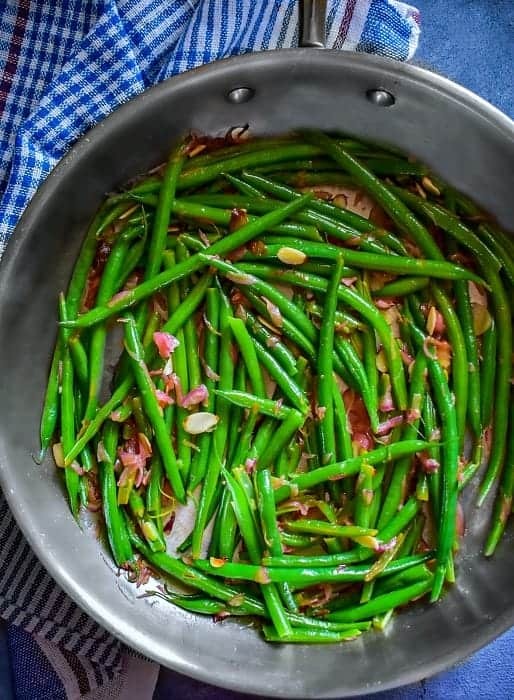 Best Green Beans Almondine (Sauteed Green Beans Recipe) : buttery, tender and delicious in every bite, these green beans are sauteed with almonds, lemon, and onion. 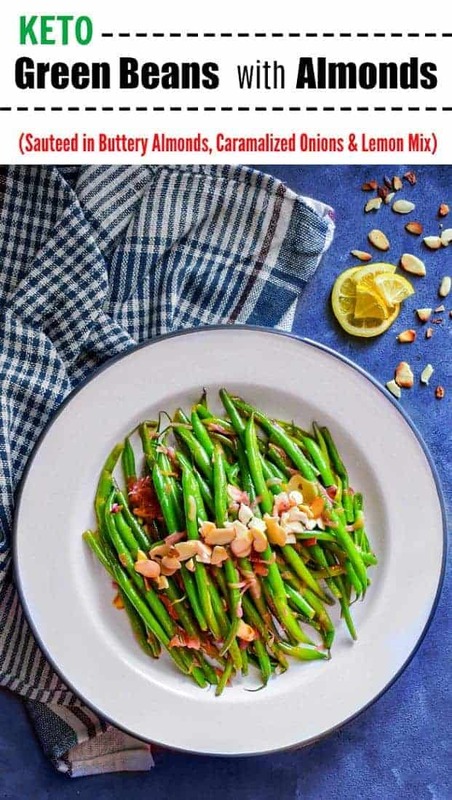 It finally is beginning to feel a little like spring as we make these Green Beans with Almonds. 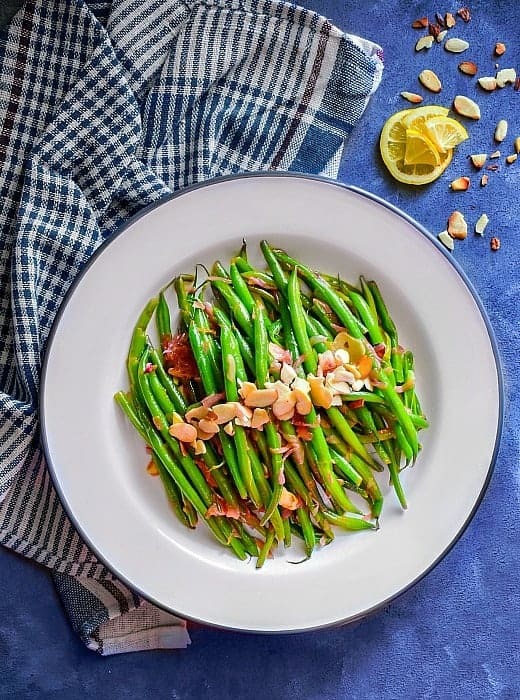 What is Green Beans with Almonds or Green Beans Almondine? 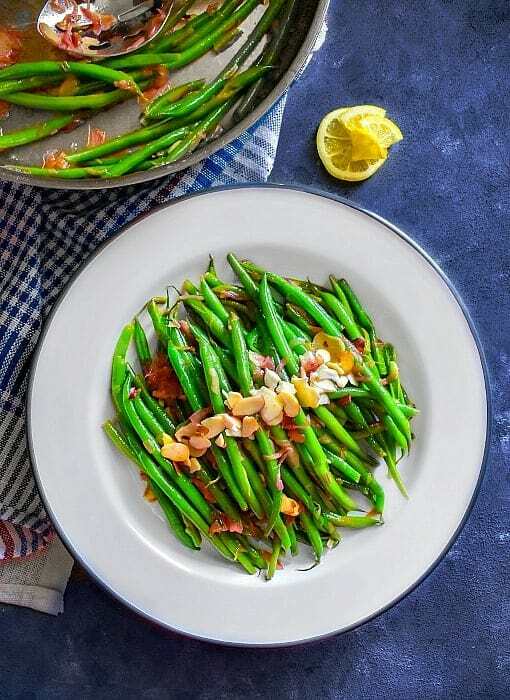 It’s fresh French Green Beans, blanched and then cooked in a buttery – lemony almond mix along with caramelized onions and garlic. 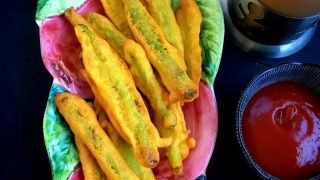 They can also be made using Canned Green Beans or Frozen Green Beans but then we don’t blanch them as they are already cooked and tender. 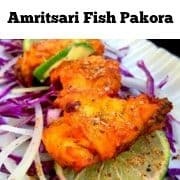 In other words, this recipe is Fingerlicking Addicting !! Now, we have all cooked Green Beans before and If like me, you also wondered ‘Why can’t they look as green and tender as in Restaurants’? 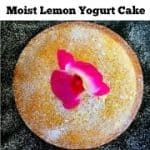 The answer is a cooking process/technique called ‘Blanching’ and also the first step of our recipe. Blanching means cooking something in boiling hot water for a few minutes and then transferring the cooked ingredient to a bowl of chilled water/ice to completely stop the cooking process. 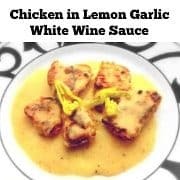 This not only cooks the ingredient but also retains the color + tenderness. I’m using French Green Beans (with ends off), also known as ‘Haricots Vert’, they are thin and tender. Once the beans are cooked for 2 minutes, then I transfer them in a large bowl filled with ice+water. This immediately stops the cooking process and helps green beans retain their bright green color. Then you transfer the blanched beans to a separate bowl or kitchen towel for later use. Once the green beans are blanched, we are ready for the next and final step, caramelizing the onions in a buttery – lemony mix along with garlic. Then sauteing the blanched green beans, adding toasted almonds and simply sauteeing everything one last time for that buttery luscious taste. 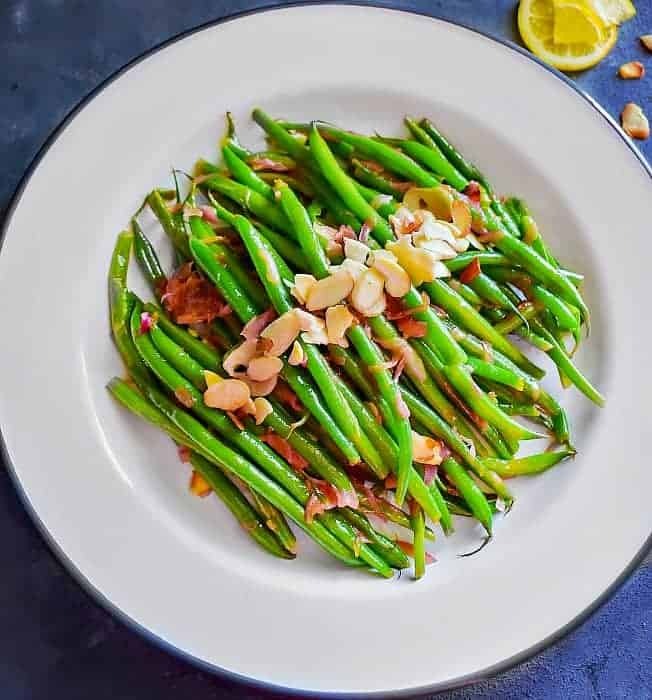 The Green Beans with Almonds recipe or Green Beans Almondine recipe takes 15 minutes and makes a perfect side or even an entree. 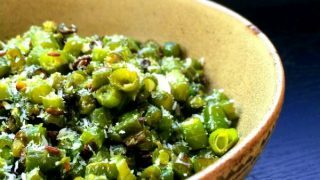 We usually like to make a big bowl of these beans and serve with toasted baguette or even sourdough bread. 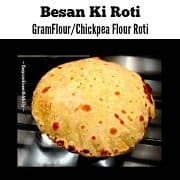 These can be stored in an air-tight container and kept in fridge for upto 2 days. Since they are already tender and buttery, I would not store them longer. 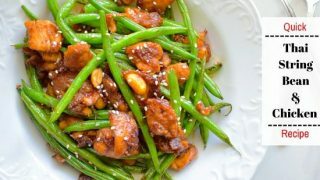 An easy and delicious string beans recipe sauteed with chicken, bursting with Thai flavors. 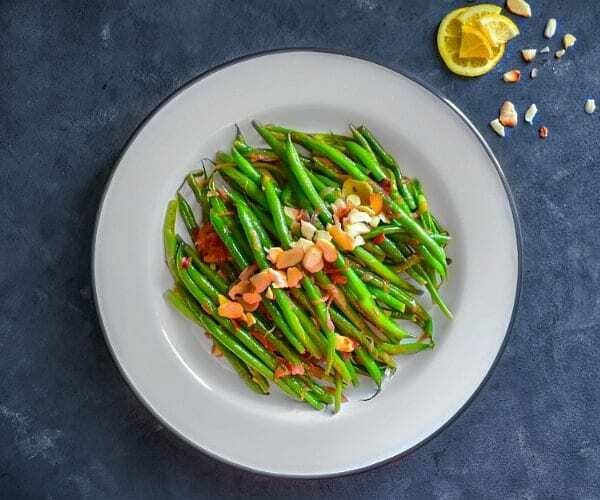 Easy Green Beans with Almonds: buttery, tender and delicious in every bite, these green beans are sauteed with almonds, lemon, and onion. 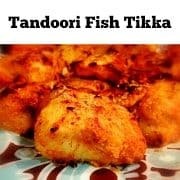 Can be cooked using canned green beans or frozen green beans too. Heat 1 Tsp olive oil and add the almonds. Saute for a 1 minute over medium heat and turn off the heat. Transfer the toasted almonds to a cooling plate. 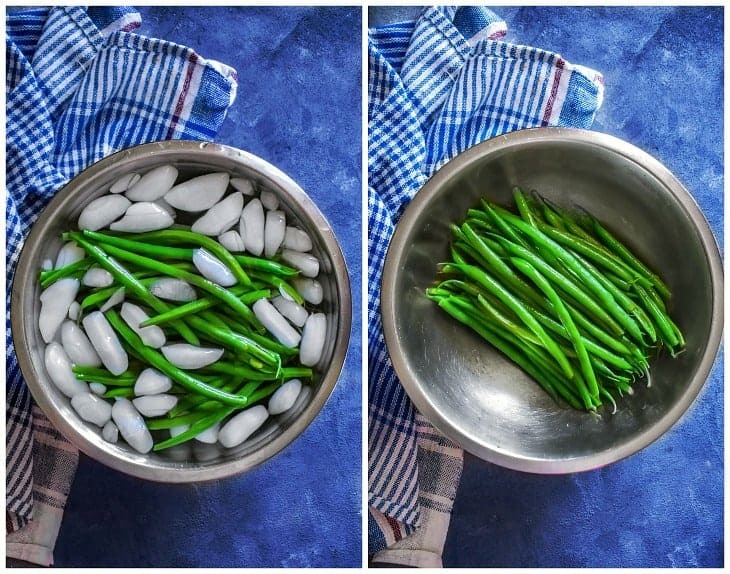 Take a large bowl filled with water+ice and transfer the cooked beans in it (this stops the cooking process and retains the bright green color in beans). Transfer the beans to a clean plate / kitchen towel and keep for use later. In a large pan, heat the butter and oil for a 1/2 minute. Add diced onions and saute for a minute over medium heat. Add the blanched beans and saute cook for another 2 minutes (please donot mix/stir the beans too much or with force as they will break easily). Add the lemon juice, 2 Tbsp toasted almonds, saute everything and cook for another minute. 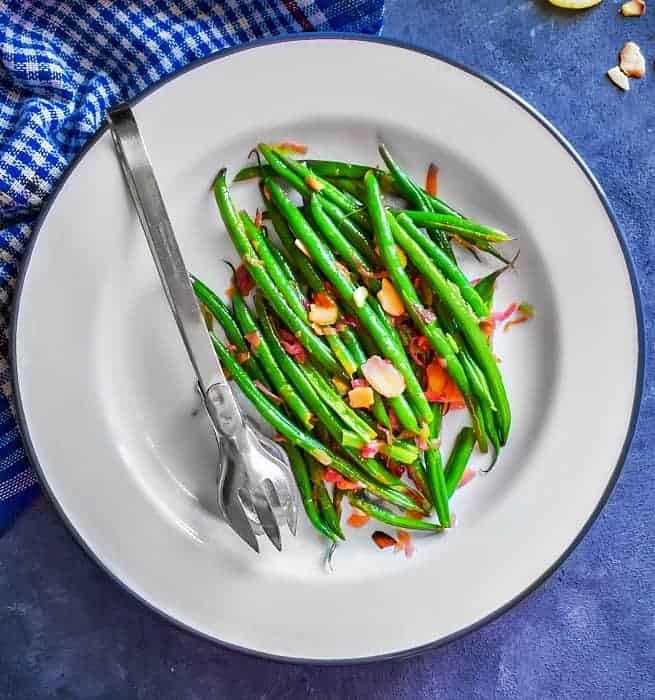 Turn off the heat and transfer the Green Beans with Almonds to a serving plate. Sprinkle some toasted almonds on top and serve hot. 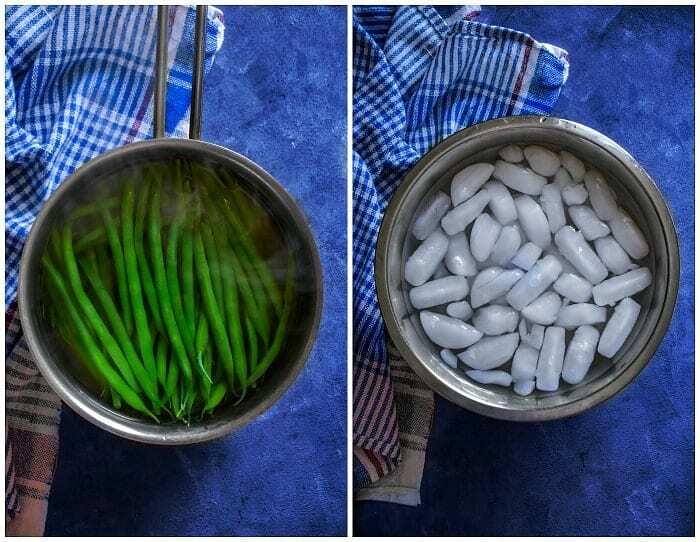 If you are using French Beans / Haricots Verts, you need to boil them for 2 minutes as they are already tender. 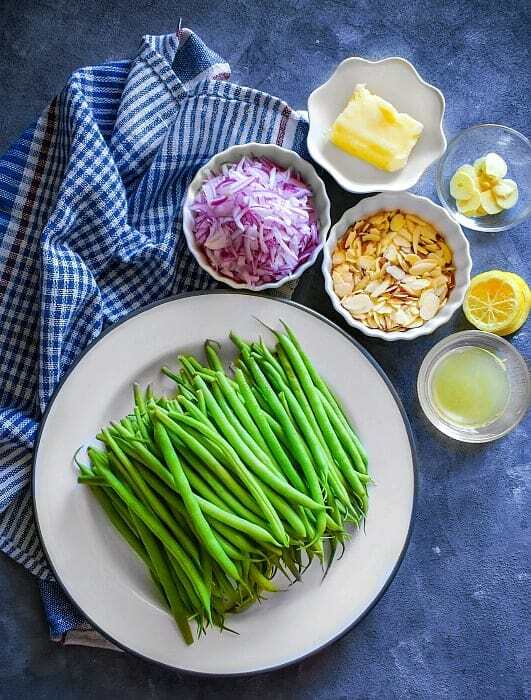 If using regular Green Beans, boil for 3 minutes to make them tender. If using Canned / Frozen Beans, DONOT Boil as they are already cooked and tender. 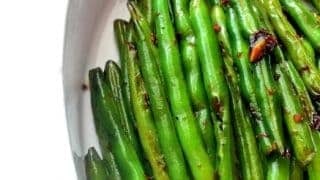 No Replies to "Best Green Beans Almondine (Sauteed Green Beans Recipe)"